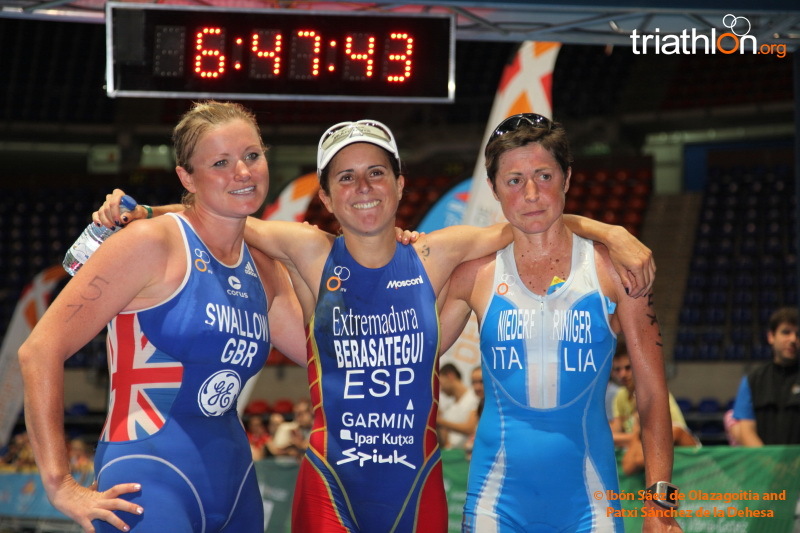 While Olympic distance is the focus next week in London, this week some of the world’s best endurance multisport athletes will head to Spain to contest the 2012 Vitoria-Gasteiz ITU Long Distance Triathlon World Championships. The event has a strong history, with athletes like Simon Lessing, Greg Welch and Chrissie Wellington taking the titles in the past, and this year athletes like Enelko Llanos, Dirk Bockel, Chris McCormack, James Cunnama, Jodie Swallow and Caroline Steffen are aiming for gold. The 2012 world titles will be decided over a 4km swim, a 120km bike leg and a 30km run in Vitoria-Gasteiz, which is the capital city of the province of Álava in northern Spain. Great Britain have had an incredible run of success in the women’s field in this world title event, winning five out of the last six ITU long distance world titles. But the only other woman who has stopped a British win was Switzerland’s Caroline Steffen, who won in 2010, and she will race again here. In Britain’s corner is Jodie Swallow, who won this event in 2009 and finished second in the 2010 ETU European Long Distance Triathlon titles in Vitoria-Gasteiz. Home-favourite Virginia Berasategi will also be a contender, she won the 2010 European titles and is the third athlete in the elite women’s field with an ITU world title under her belt, she won this event in 2003. Others to watch for over this grueling distance include Denmark’s Camilla Pedersen and Michelle Vesterby, as the pair went 1-2 at last year’s ETU European LD championships and Australia’s Sarah Crowley, who was once a regular on ITU’s Olympic distance circuit, the USA’s Jennifer Tetrick and South Africa’s Caroline Koll. Spain’s Eneko Llanos is already a triathlon legend, having competing in two Olympic Games and then making a successful transition to long distance triathlon racing. But this race is set to mean more than most as Llanos is racing at home. Llanos last won this race in 2003, and also won the European titles in Vitoria-Gasteiz in 2010. But he’s not likely to have it all his own way, with an impressive list of men lined up to try and claim an ITU World Championship. Leading those will be Australia’s Chris McCormack. Macca made a return to Olympic distance racing last year with an aim to try and make the Australian team for London, but after he didn’t achieve that is back at the long distance he has dominated for so long. While McCormack is a two-time Kona champion, he is yet to add an ITU long distance world title to his resume. Others to watch include the in-form Luxembourgh’s Dirk Bockel, a Beijing Olympian who finished fourth at Kona last year and South Africa’s James Cunnama, who broke eight hours racing in the 2012 Roth ETU Challenge Long Distance Triathlon European Championships just a few weeks ago. France’s Sylvain Sudrie will wear the No.1, he won the title in 2010 and finished third at last year’s world titles in Henderson, Nevada. Also keep an eye on Ukraine’s Viktor Zemtsev and Spain’s Miquel Blanchart. Overall, 15 different countries be will represented in the men’s race. The 2012 Vitoria-Gasteiz Long Distance Triathlon World Championships have been launched in Spain this week, and ITU President Marisol Casado has said the event will leave an important legacy.